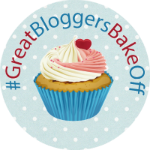 So I managed to get a little bit behind with the Great Bloggers Bake Off, and whilst the dacquoise is on my to-do list I decided to get ahead of myself and have a go at the Opera cake. And, yes, when I say getting ahead of myself, this is of course acknowledging I am now still a week behind! Catching up was the right choice, I managed to make a cake that Mr J seems to think is my best yet. I guess that's the thing with joining in with the Great British Bake Off. I am stepping away from my foolproof sponge receipe which the children devour and keep stepping into the unknown. And like Angel Food Cake, we managed to create a sponge in the Opera cake which Mr J thinks is light (the bias on egg white) and in spite of the chocolate has managed to convince himself is light, and therefore good for you. As I decided as I was making the cake that I wanted an Opera Cake which the children could eat. Cost had also proved a deciding factor (after pricing up raspberries in the volume needed by some recipes) so, I ended up adapting a few recipes. I did use ground almonds (I never know the rules about eating nuts where children are concerned, I decided they would be eating the cake with our supervision and there was no choking hazard so I was ok), and although I had prepared an expresso with the purpose of making a coffee syrup and buttercream, my parenting mind got in the way and I ended up nipping to Tesco to get more chocolate (sugar vs caffeine where children are concerned... I'm convinced caffeine is worse but really?!). So, with the children on side, we set about to making a chocolatier's delight. Preheat the oven to 220C/425F/Gas 7. Grease and line two 46cm x 33cm/18in x 13in baking trays. Whisk the egg white in a clean bowl until soft peaks form when the whisk is removed. Slowly whisk in the sugar and continue to whisk until stiff peaks form. Cover the bowl with cling film and set aside. Beat the almonds, icing sugar and eggs together in a separate bowl for 3-5 minutes, or until the mixture has doubled in volume. Fold in the flour and cocoa powder. Gently fold the whisked egg whites into the mixture. Spoon a little of the mixture into the melted butter and mix until well combined. Tip the butter mixture into the cake mixture and fold together until just combined. Divide the mixture evenly between the two tins, spreading it smooth, especially at the corners. Bake for 7-10 minutes, or until pale golden-brown and cooked through. Remove the cakes from the oven, cover with a large piece of greaseproof paper and carefully turn out the cakes. Peel off the greaseproof paper from the bottom of the tin. Cut each cake in half and set aside to cool completely. Whisk the egg yolks for five minutes in a bowl, or until pale and foamy. Heat the sugar and water in a saucepan until it reaches 120C/250F (hope for the best if you don't have one- it works). While whisking the egg yolks, slowly pour the syrup down the sides of the bowl. Continue to whisk for a further five minutes, or until the bowl is no longer warm to the touch. Beat the butter into the mixture, one piece at a time, then add the vanilla essence and melted chocolate. Beat the butter and icing sugar together in a bowl until pale and fluffy. Heat the golden syrup and double cream in a saucepan until just boiling. Pour the cream mixture onto the chocolate and set aside for two minutes. Whisk the ganache until smooth, then whisk in enough hot water to loosen the ganache into a pouring consistency. Place one cake square onto a serving plate. Spread over half of the French buttercream. Top with another cake square. Spread over the chocolate buttercream. Place another cake square. Spread over most of the remaining French buttercream (reserving three tablespoons for the top). Top with the final cake square. Spread with the remaining French buttercream. Spread the chocolate ganache over the top of the cake. Ok, so the sponge wasn't baked evenly, so I should have shimmied them round to gain evenness (I had no idea). But on the achievements- joconde sponge really is delicious.This was my first time creating french buttercream, and this too was delicious. And yes, this was completely chocolate heaven, so I massive thumbs up! And, if you're wondering, I have found my new secret to sharing, counting to five and alternating. 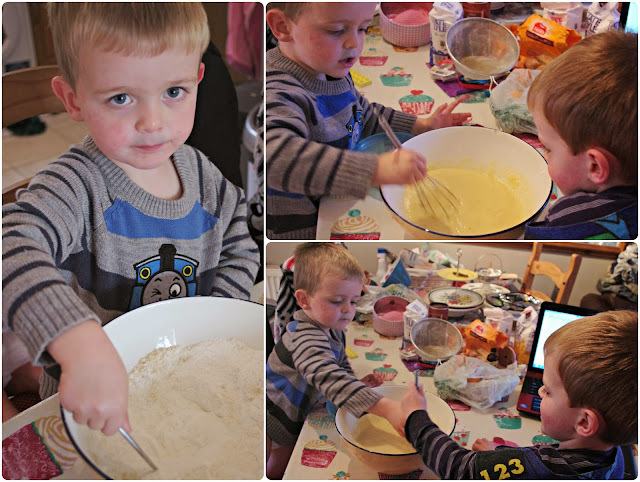 The boys were so excited to hand the spoon, sieve or whist over on the count of five we managed a practically perfect bake for them. As always, a massive thanks to Helen and Jenny to keeping the motivation going. I know I wouldn't have got this far without their support, and when I see the positive feedback from friends about my baking skills- I remember my little girl's 3rd birthday cake and laugh. Not even I thought this was possible!